Agriculture is the largest water user in Australia. Where do other sectors like mining, manufacturing, and household use fall? Like in most regions of Australia, agriculture is the biggest user of water in the state of New South Wales, where academics fear that adding another industry — coal seam gas production — could pump water from already over-extracted aquifers. 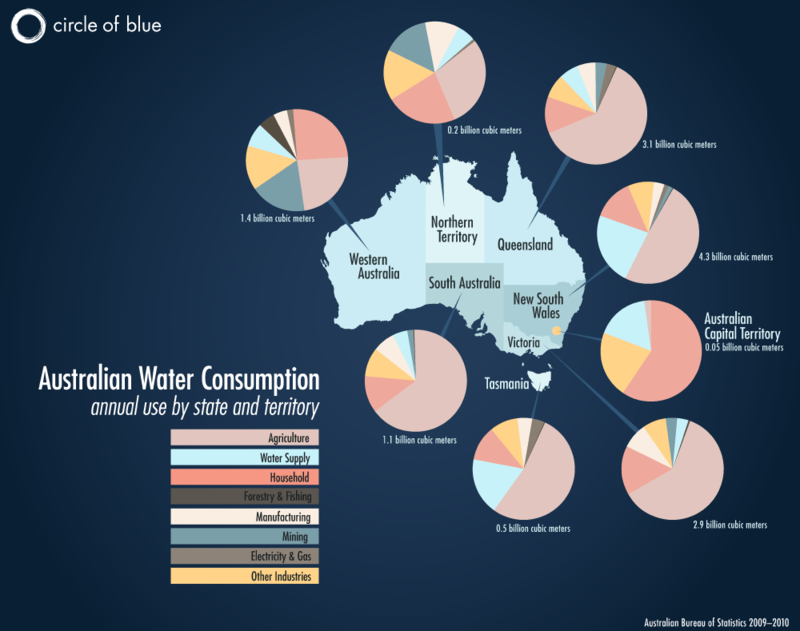 This infographic breaks down the biggest users of water in each Australian state and territory. Amanda Northrop is an undergraduate student at Grand Valley State University and a Traverse City-based design intern for Circle of Blue. This infographic was made to accompany an article written by Circle of Blue reporter Nadya Ivanova: Australia’s Agriculture and Energy Sectors Clash Over Water. Reach Northrop at circleofblue.org/contact.